Alright y’all, brace yourself now and prepare your facial muscles. 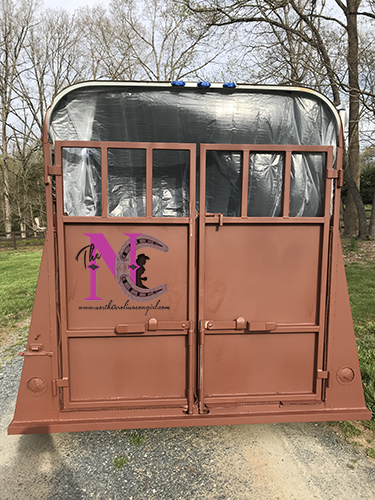 I’m certain I’m going to have some dropped jaws when you see what I did to my new horse trailer! LOL. 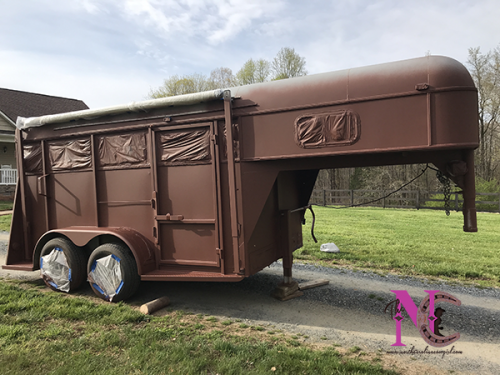 The quick story – I bought a small stock horse trailer to use for day hauling and it needed some TLC. 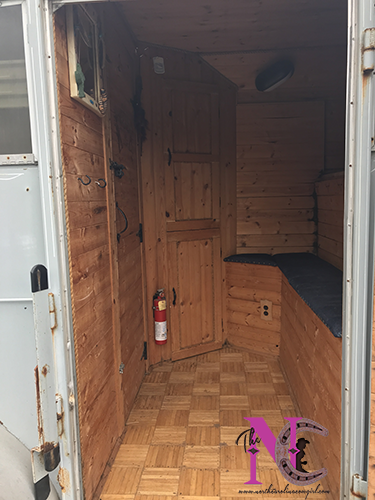 The previous owners converted the front area of the trailer into a living area, which left barely enough room to trailer one horse. So everything had to go. 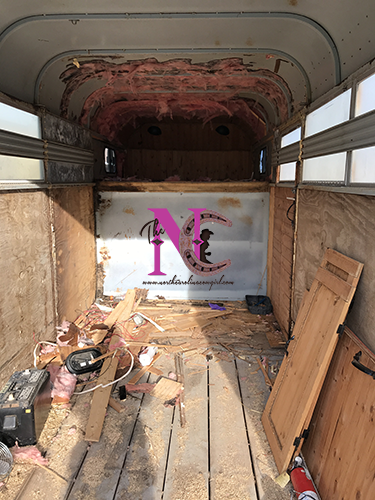 We gutted the inside, removing everything but the wood side walls, and grinded down all the rust spots on the exterior so we could put a fresh coat of paint on and hit the road. If you’re interested in the nitty gritty details, keep scrolling down . I must worn you though, I wrote a novel. Since I’ve made some of you wait 2 weeks to see these results, I won’t make you wait any longer. 😉 Here are before and after pictures. Now for those of you interested in all the details. Let’s get to it! Whew Wee, talk about fun! 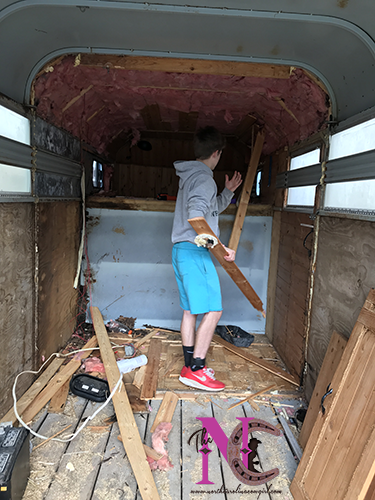 Out of everything that had to be done, the 2 days it took us to gut the trailer, were by far the most fun we had during this project. Not to mention, my son and I got to do this together which made for some great bonding time. 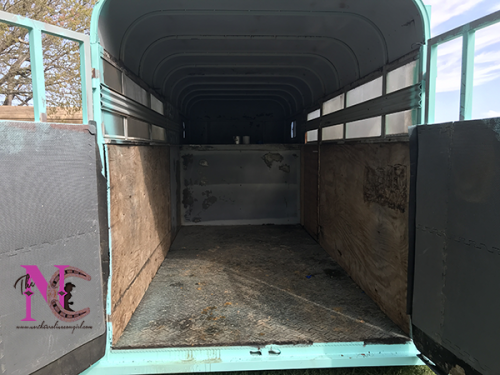 Here’s a look at the inside before we gutted it. Because we didn’t want to mess up any of the metal or flooring, we had to take our time and unscrew each piece of wood that was screwed in. 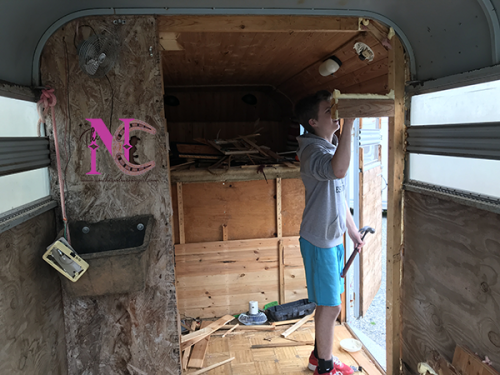 Once all of those were out – and I mean HUNDREDS – we finally got to start ripping the wood out. After the wood was out, we carefully took all the insulation off the walls and ceiling then removed the carpet. As you can imagine, this was a DIRTY nasty job. 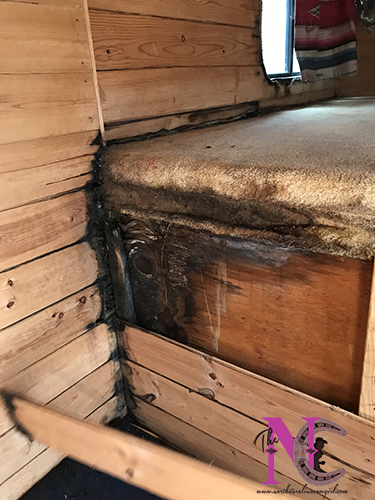 It wouldn’t have been so bad, if the LQ had been sealed properly and didn’t have water damage and MOLD growing in the walls. But it did, so in places the wood came out in small broken black pieces. Oh, and did I mention the thousands of ants we kept finding in the walls. Yep, you read that right. ANTS! 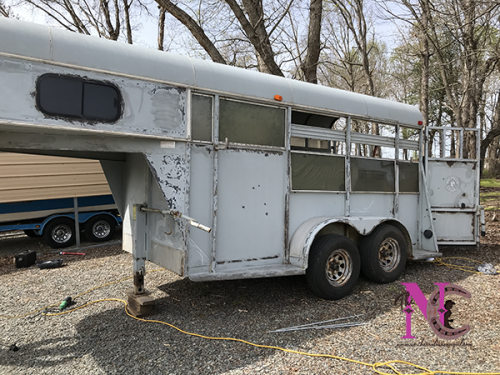 All of that’s gone now and the horse trailer is back to basics. 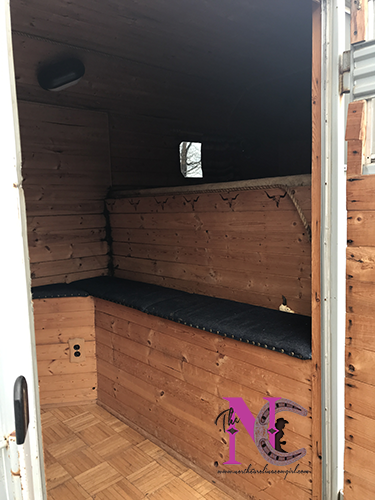 I have the full 12 ft to haul in and now I just need figure out a clever way to make a tack area that won’t take up much space. I think I’ve got an idea though and as soon as I have time and the motivation, I’ll finish the inside. For now, it’s usable as is and I’m sooo ready to hit the road trail riding locally again. The inside was fun. 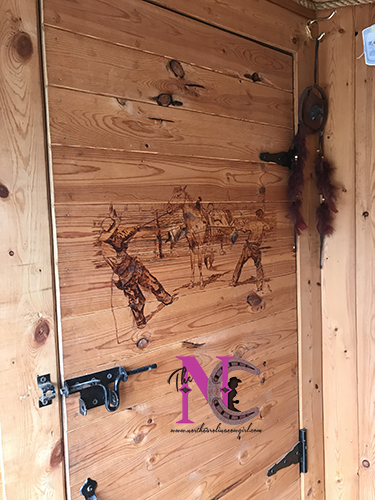 The outside, was a lot of freakin’ work – that I had to do alone because no one wanted to do it, go figure! – but very rewarding when it was all said and done. 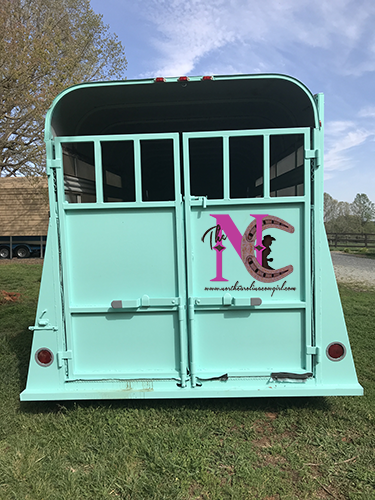 I couldn’t be more proud of my little trailer and how great it turned out. The exterior was a slow process and took longer than I had expected to finish. 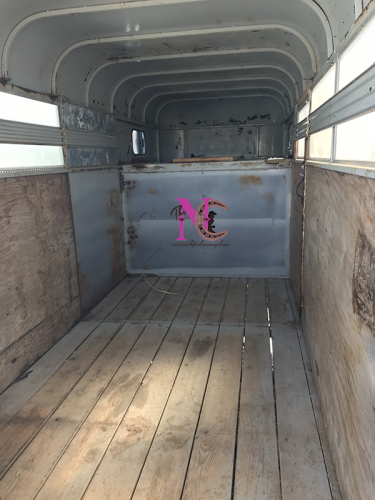 First, we had to get all the rust off so it couldn’t rust any worse and the finished paint job would be smooth. 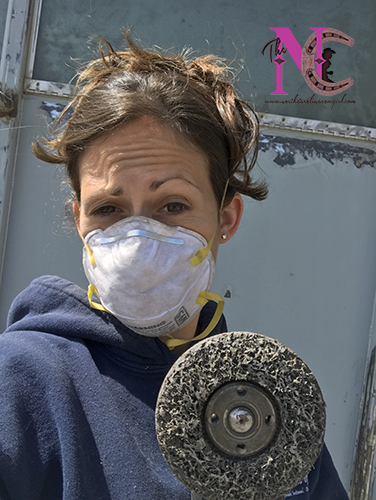 To do this, I used the grinder with the wire brush attachment to hit the thick spots. 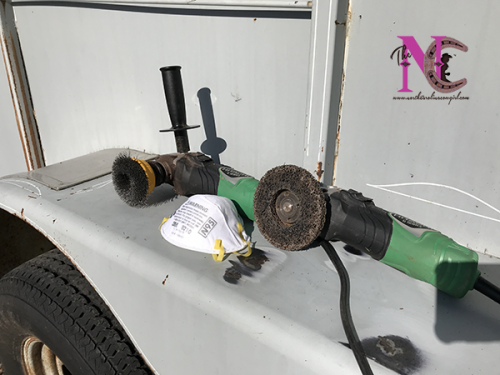 Once those spots were cleaned up as best as I could get them, I used the grinder with the sanding disc to get the rust off down to the shiny metal. With the sanding disc, I could get off the pin stripes and remove any old caulk that needed to come off. If I’m being totally honest, I liked using this attachment better than the brush. I like that it cleaned the rust and paint off completely. I was surprised to find rusted spots under paint though. Not a ton of places and always near the badly rusted spots and under some of the pin striping. 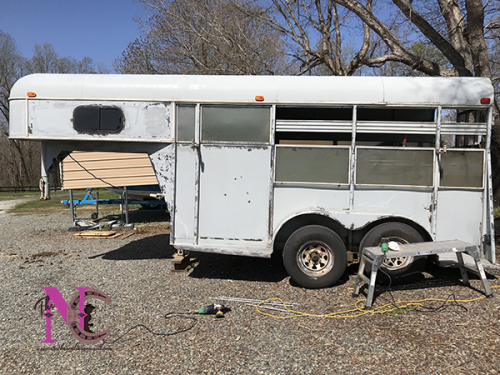 To prime the trailer, I used 1 can of Rust-Oleum Rusty Metal Primer and sprayed it on using a paint gun. Lawd, what a mess this made on me. The wind was blowing a little bit the day I did this, and OMG it got all over me. It was all in my hair and on my face. Ugh. Not a fan of oil-based paints. If I had to do this over, I think I’d used the bonding primer I bought for the aluminum pieces. It was a latex base primer that cleaned off so easy. 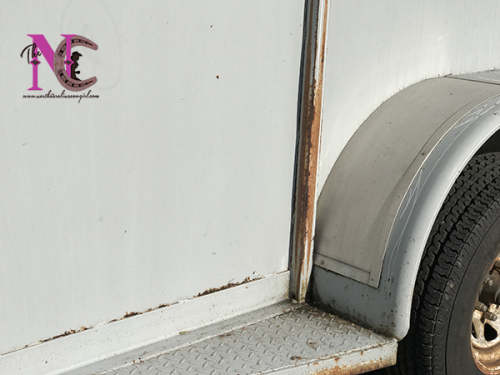 As a note, it only took 1 can of primer to completely cover the trailer. Once the primer completely dried – I gave it a full day and night – it was time to paint. Eeek!! I knew I wanted a teal color that would stand out and make a statement, so I went with “tantalizing teal” by Sherwin Williams # SW 6937. 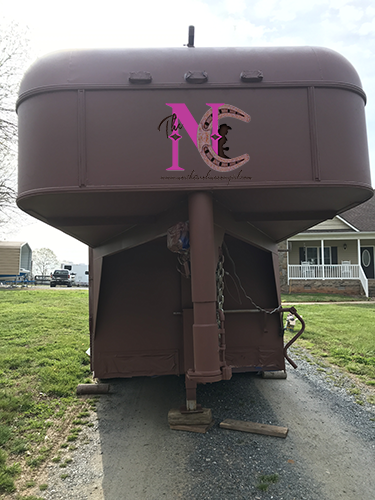 Since I had my share of a horrible paint day already, my sweet husband offered to spray the trailer this time. He did a wonderful job too. He started with the top of the trailer and while he was up there I swear my anxiety was through the roof. I could just picture the metal caving in and him falling through. Thank goodness it didn’t happen, nor did I die from lack of oxygen intake during that time. 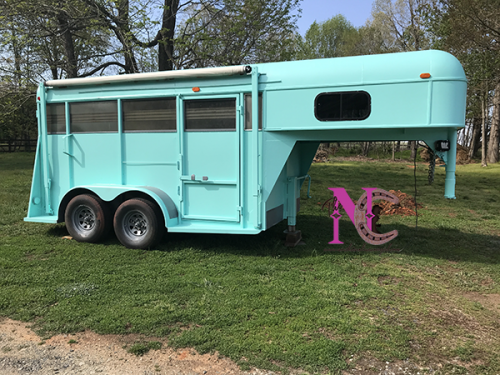 Anyway, moving on, we sprayed the entire outside of the trailer in the teal. The only place we didn’t spray was under the fender or the rims. 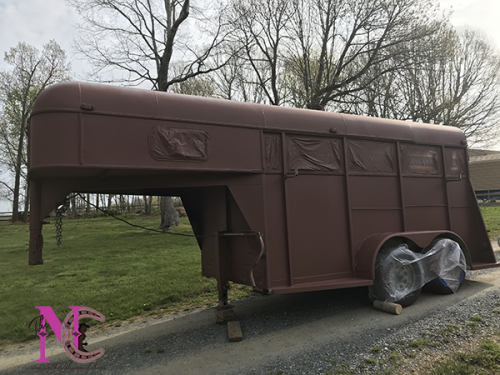 Next, we took the wheels off, one side at a time and sanded them down to remove all the rust and then sanded the fender down as well. We used spray can primer on the rims and under the fender and then covered the areas with Gray spray paint. At first I did think the color was a little too bright but this week it’s really grown on me. 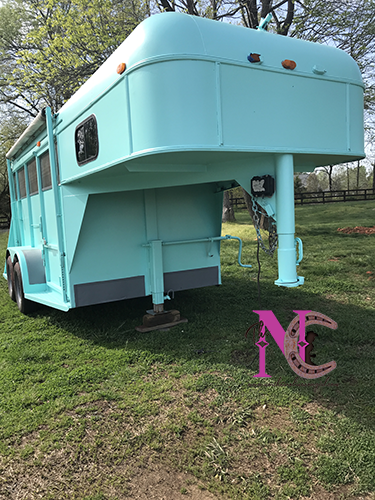 I love the color of the trailer now. It matches my panel set. Plus, I don’t think there’s another one on the road that looks like it. That’s it for now. I still haven’t finished the inside and probably won’t for a while since it’s usable as is. Eventually though, I will get the inside sanded down and repainted. 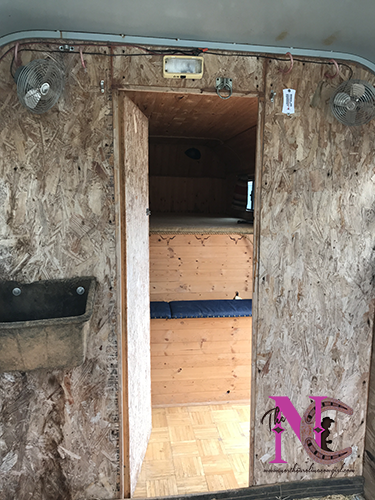 As well as, adding a small “tack space” and putting up foam padding on the walls. When I get all that done, I’ll share it on here. 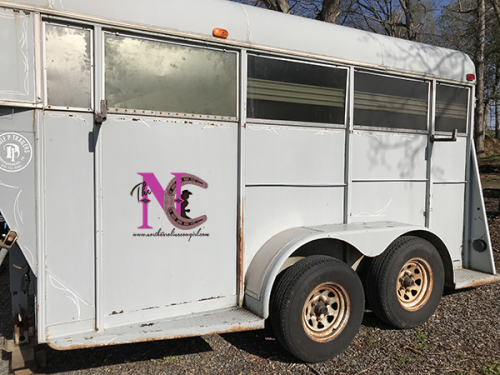 Have you ever done your own #fixerupper horse trailer project? hey, you can sand and paint mine now! Wow! You took on a huge project & it turned out great! 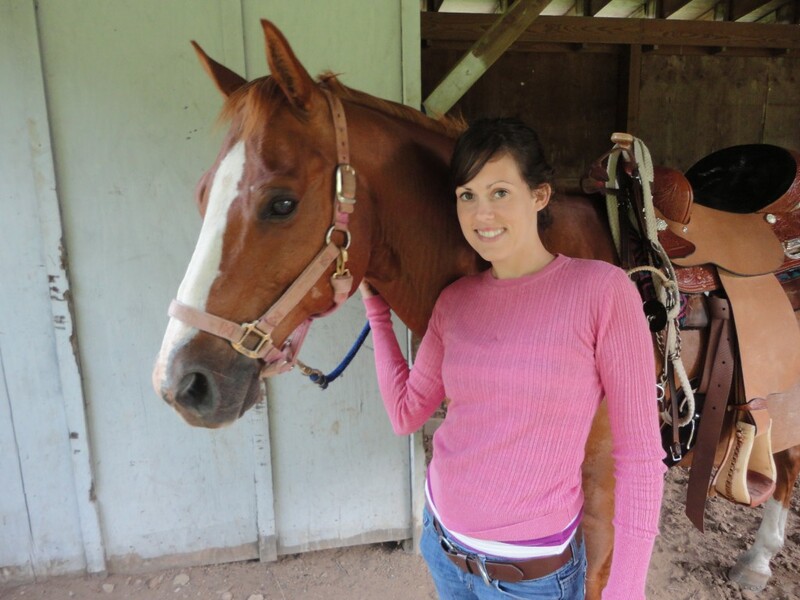 Love the color…although anonymity will be completely lost lol Everyone will see you coming. Don’t think I ‘d be rushing into tack project phew! Girl, you just did a serious DIY project! You have basically made any project I’ve ever taken on look weak lol. The paint job on this is amazing!